Việt Nam’s U23 team left it late, but managed a 1-0 win over Indonesia in the Asian Football Confederation U23 Championship qualification round in Hà Nội yesterday. Triệu Việt Hưng injury time winner in the 93rd minute was enough to ensure the home nation stay within goal difference of the top of Group K.
They will next play Thailand on Tuesday in a match that will decide who finishes the qualifiers in top spot. As the clock ticked, Hưng found himself in between the bigger Indonesian defenders to nod the ball home past of goalkeeper Awan Setho Raharjo. Việt Nam, with home advantage, dominated from the start attacking down both flanks. They had most of the possession in the opening 15 minutes but couldn’t beat Raharjo. At the other end the defenders were guilty of making mistakes and Thành Chung nearly scored an own goal slicing a clearance that fortunately for him fell the wrong side of his own post. Vietnamese keeper Bùi Tiến Dũng also kept Indonesian at bay, keeping his net safe in the first half. Meanwhile keeper Dũng made a serious mistake when he cleared ball to Indonesian striker Marinus within his box. But the Hà Nội FC player successfully stopped the finish. Việt Nam were given their fourth corner kick in the third minute of the extra time. 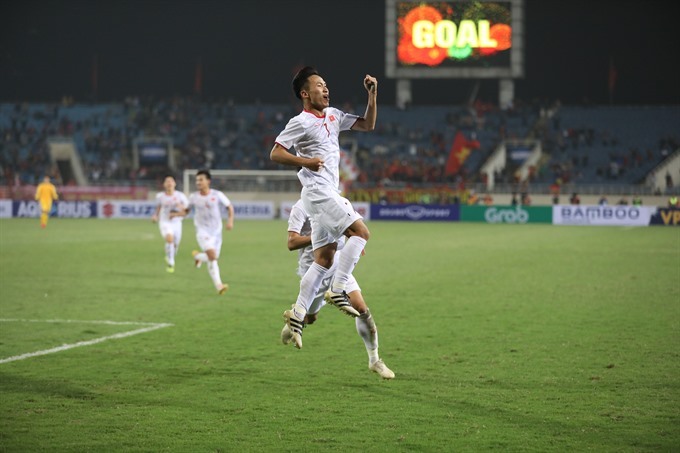 Talented midfielder Nguyễn Quang Hải’s cross found Hưng who cheered up thousands of supporters in the stands, including Prime Minister Nguyễn Xuân Phúc by grabbing a late winner. Winning the second match Việt Nam rank second in the table behind Thailand on goal difference who trounced Brunei 8-0 in an early match of the group. Tiny Brunei could only keep their net safe 21 minutes before Supachok Chaided began the route with most of the goals coming in the second half. Việt Nam will meet Thailand on Tuesday in the last group stage match while Brunei will play Indonesia, are both out of the competition. Speaking with reporters after the match Indonesian coach Indra Sjafri congratulated Việt Nam and wished the hosts go through to the finals. He said it was a disappointing result for Indonesia but it was only one competition and they had to look forward. Coach Park was not pleased with his players, saying it was a lucky win. The South Korean said his players did not show team spirit, had no connection with each other and played selfishly. He added the players did not understand their duties saying Việt Nam had not prepared well for this tournament.